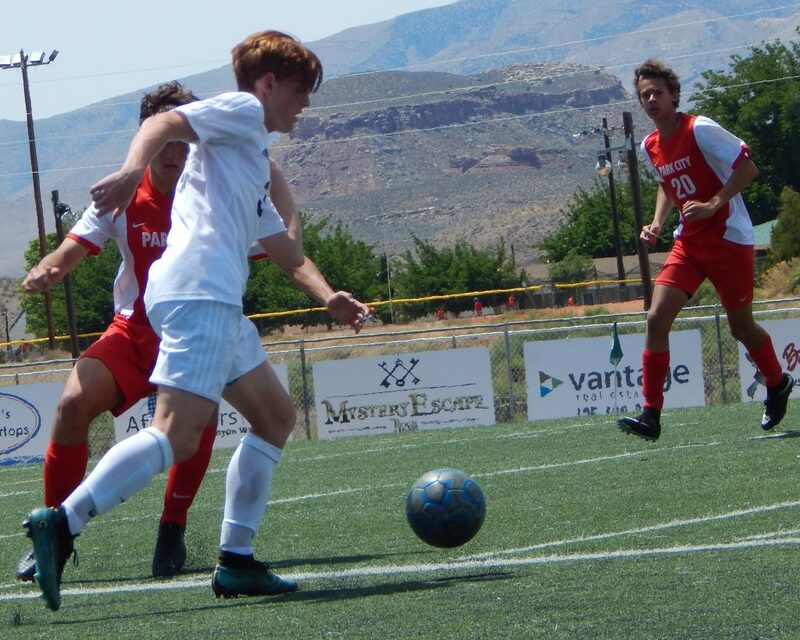 ST. GEORGE – An underdog will be the 4A state soccer champion this season, guaranteed. The Final Four is set for 4A state soccer, with no No. 1 seeds making it to the semifinals. 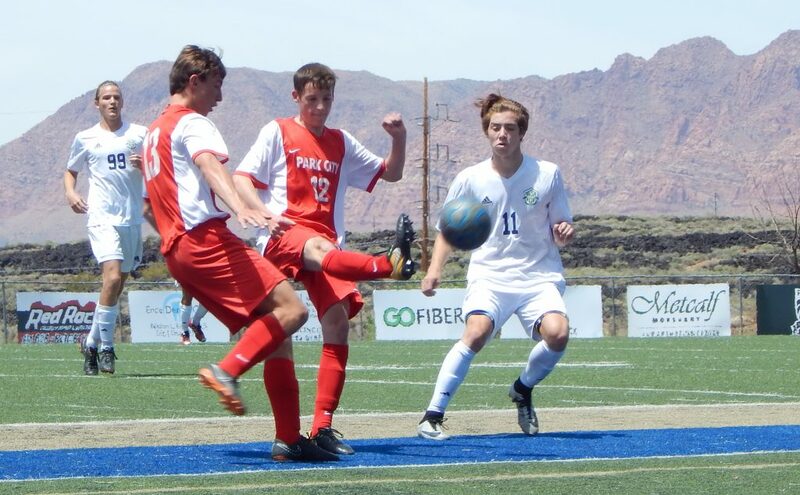 All four region champions went down at home on Saturday, with Snow Canyon getting stunned in double overtime by Park City, Dixie blasting Region 11 champ Bonneville, Desert Hills shocking Region 12 winner Logan and Juan Diego kicking its way past Region 10 leader Orem. With all the No. 1 seeds gone, it figures to be a wide open semifinals next Friday. An early favorite could be the Flyers, who have scored 12 goals in two playoff games. Dixie will face a familiar foe in Desert Hills in the later semifinal at Alta High School. 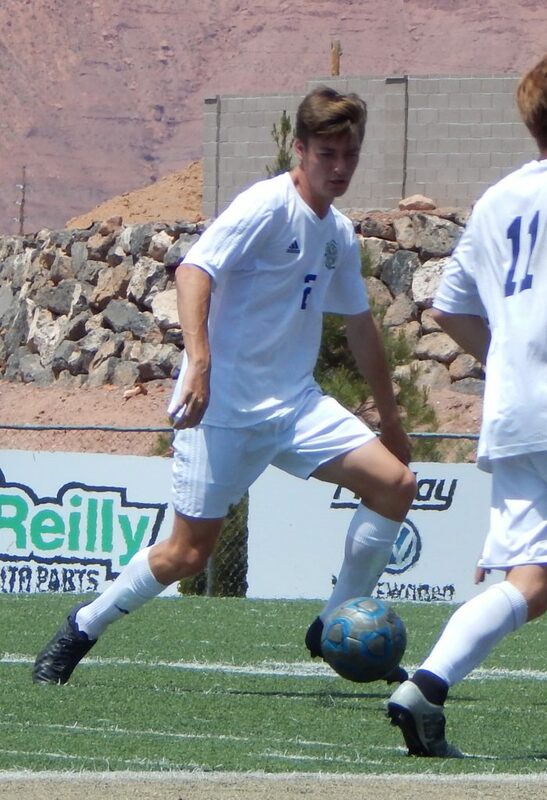 First, Juan Diego and Park City battle at 11 a.m. Friday, then Dixie and D-Hills square off at 1:45 p.m.
Senior Ross DiCaprio picked a fine time to score his first varsity goal. DiCaprio received a nice lead pass and outran a Snow Canyon defender as time wound down in the second overtime. 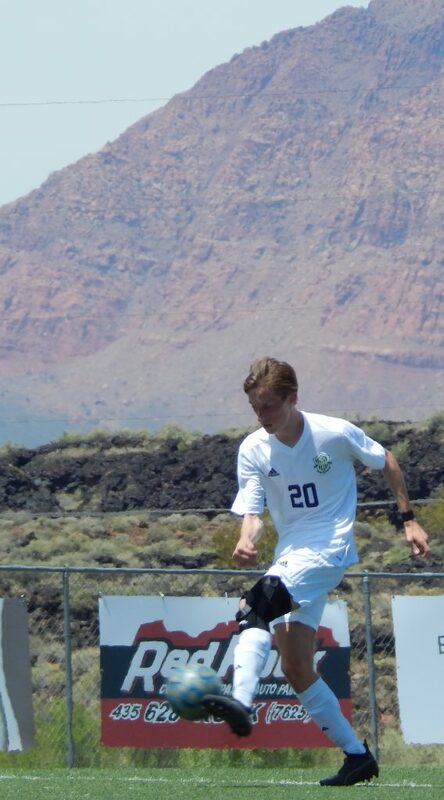 He found himself 1-on-1 with Snow Canyon’s star goalkeeper, Austin Mild. DiCaprio, who hadn’t played much in the hotly contested game, had fresh legs. 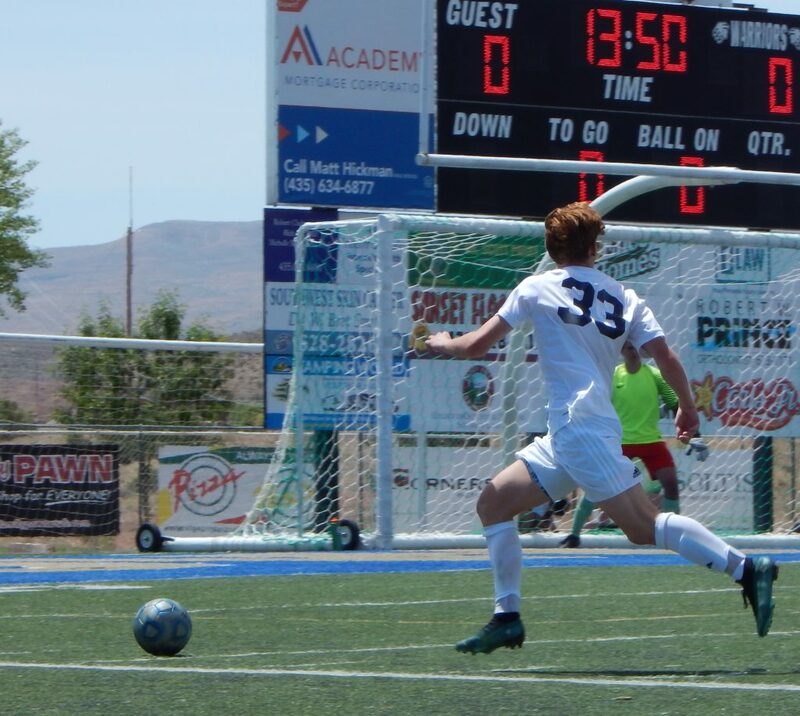 When he saw Mild come out to make a play, he fired low and left and the ball squirted past Mild and into the left part of the goal, sparking a celebration among the 21 varsity Miners and their fans. George Pineda was the man who issued the great pass, and just like that, with 2:30 left in the second overtime, the game was over. Two teams had battled to a scoreless tie for nearly 98 minutes, then it was over. Snow Canyon, three-time region champions, dominated possession in the first half. The Warriors had quite a few good chances before halftime, and early in the second period. But Park City switched up its formation and started to make some headway midway through the second half and in the overtimes. The Miners had a couple of golden chances in the first OT, but Mild shut them down. Snow Canyon also had a couple of good looks in the second OT, but couldn’t sneak one past Miners keeper Wesley Hoglin. The game looked destined for a penalty kick shootout until the nice pass from Pineda and the finish by DiCaprio with 2 1/2 minutes to play. It was a stunning ending to an amazing season for the Warriors, who finish with a 10-1-5 record. 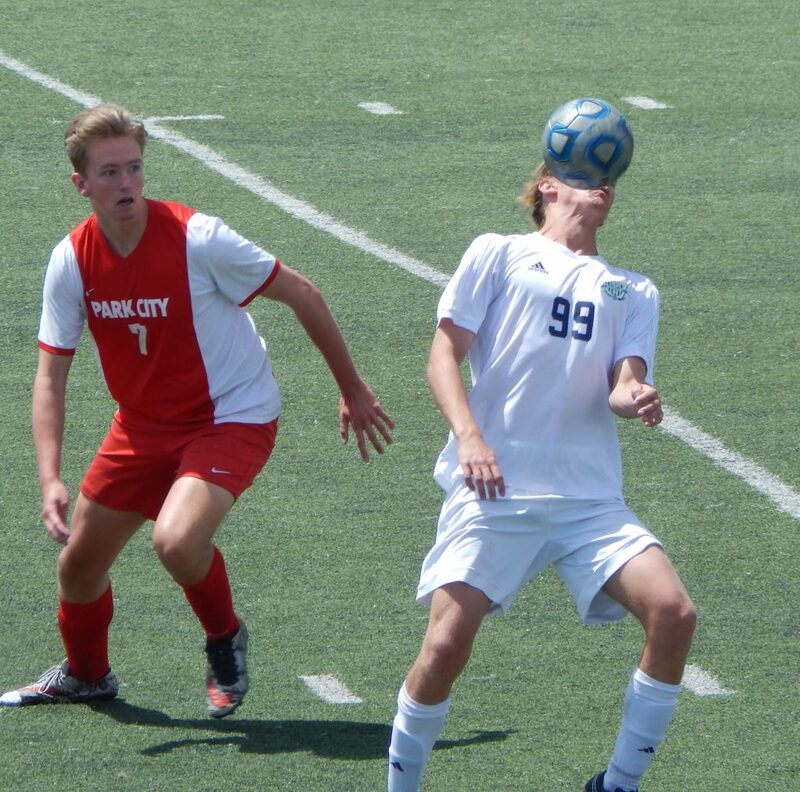 “Third region championship in a row – a hat trick there – and a great group of seniors,” Wittwer said. 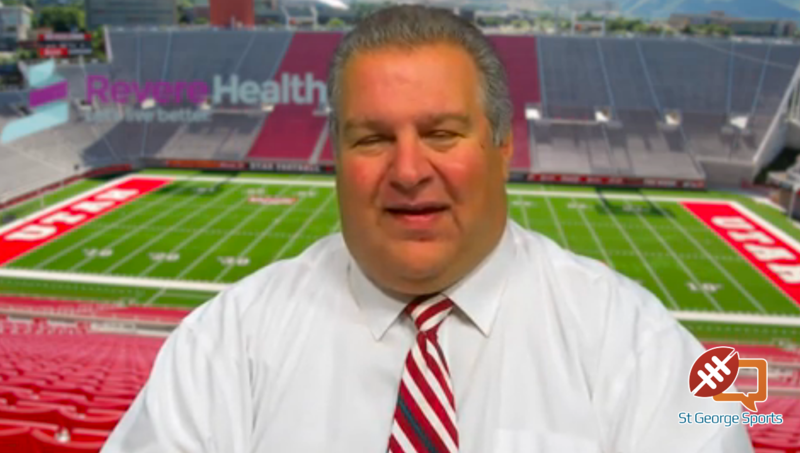 “Five or six years ago, you would have looked at this group and said it’s a rebuilding year. We graduated a lot of boys last year. But as the season started to develop, about eight months ago, I started to realize that no, these guys are as good as any team we’ve had. 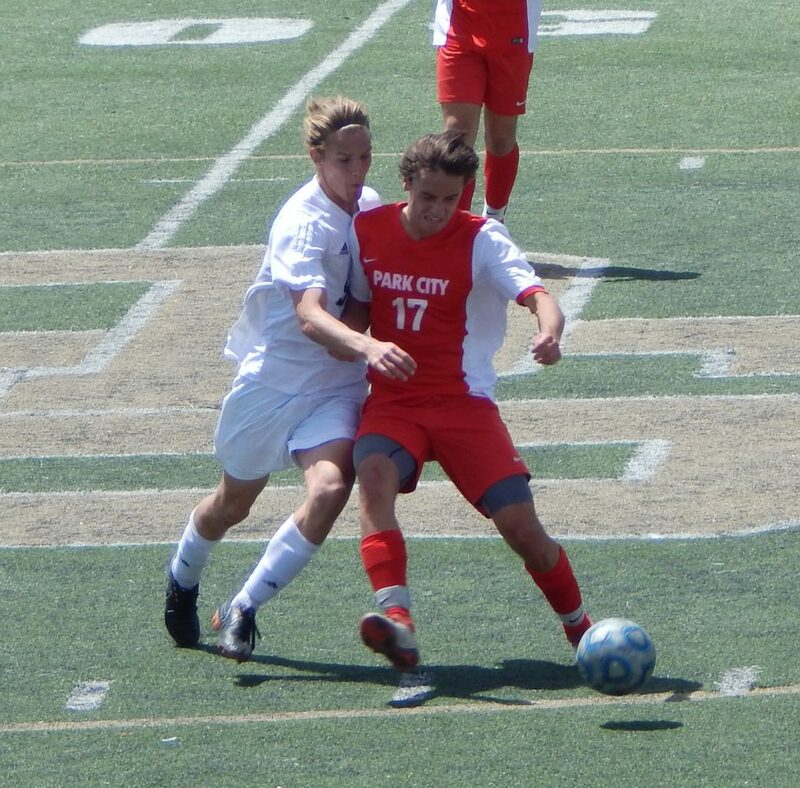 Park City moves into the semifinals and will play Juan Diego Saturday. Those two teams tied for second in Region 11, with the Miners beating the Soaring Eagle twice, 4-3 and 2-1. 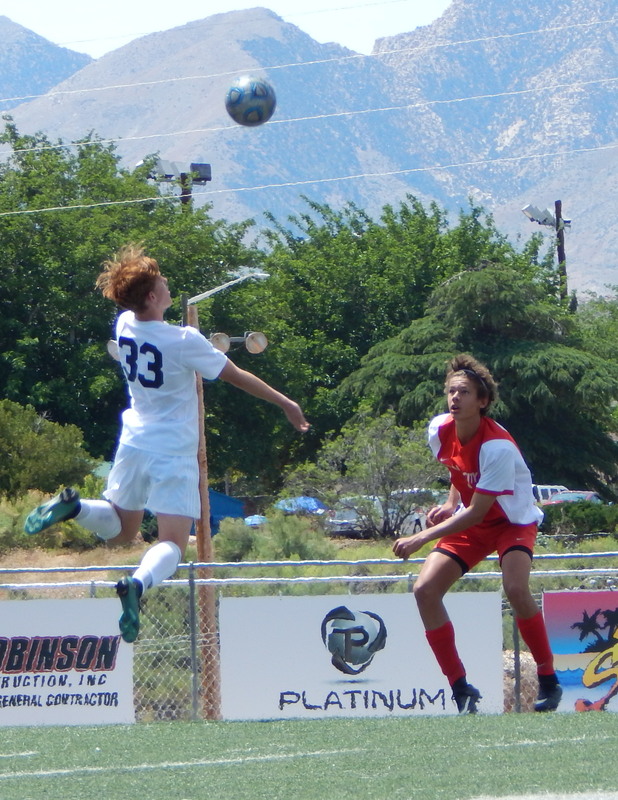 Oscar Quintero scored two second-half goals and the Flyers held down Bonneville stars Jaiden Marriott and Joe Cloward to eliminate the Region 11 champions Saturday afternoon in Washington Terrace. Dixie scored the lone goal of the first half on a corner by Xavi Flores with five minutes left until intermission. But the Lakers tied the game up early in the second half when they drew a foul in the box and Mathis Burton blasted in the penalty kick with five minutes gone since halftime. 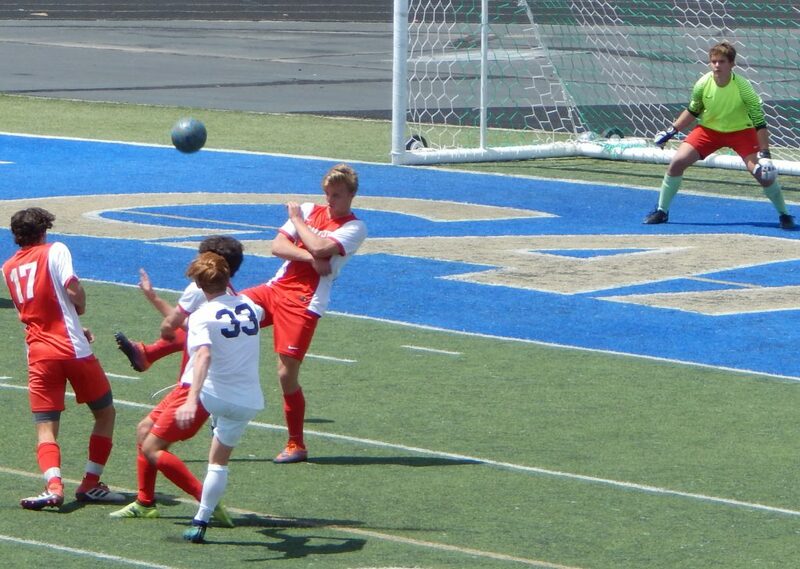 But the goal seemed to awaken the Dixie offense. Tauri Morales converted on a PK to make it a 2-1 advantage and Quintero scored his first goal on a header off a corner shortly thereafter, making it 3-1. A loose ball after a free kick was hammered home by Quintero moments later and the Flyers were on their way to the road victory. Bonneville scored a goal in the final two minutes to bring the score a little closer as Marriott recorded his state-leading 26th goal of the year, but it wasn’t nearly enough. 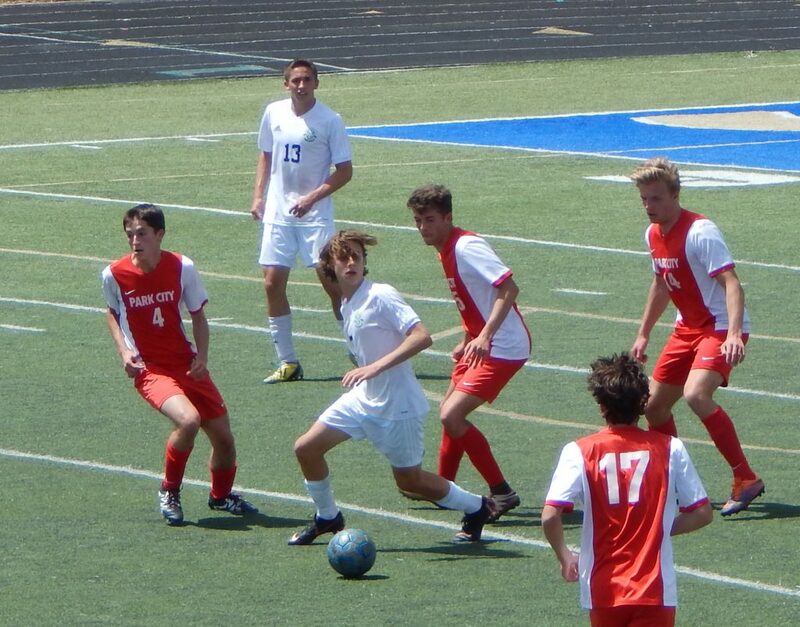 Dixie, 12-1-3, earned its way into the state semifinals. The Flyers play region rival Desert Hills Friday at Alta High School at 1:45 p.m. in the 4A quarterfinals. The Thunder captured the road win behind another strong defensive effort from goalkeeper Preston Hodges and a strong back line. The Grizzlies, champs of Region 12, led early on after a penalty kick goal by Dylan McCuskey. That made it 1-0 and the score stayed that way for the next hour. 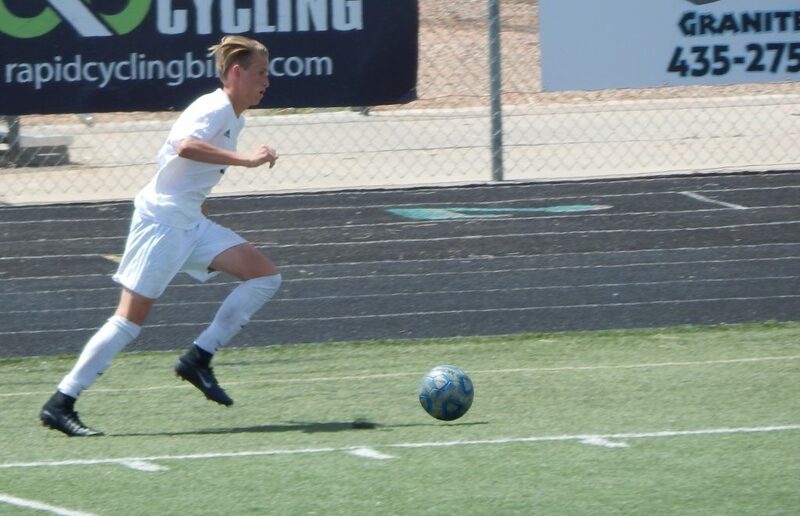 Ben Simister finally broke through with the equalizer for Desert Hills with just over 10 minutes left in the game as the senior dribbled nearly the length of the field and beat the Logan keeper. With four minutes left, Desert Hills freshman Bridger Heaton assisted a through ball to Kelton Holt, who beat two defenders and then dribbled past the keeper for the game-winning goal for the Thunder. 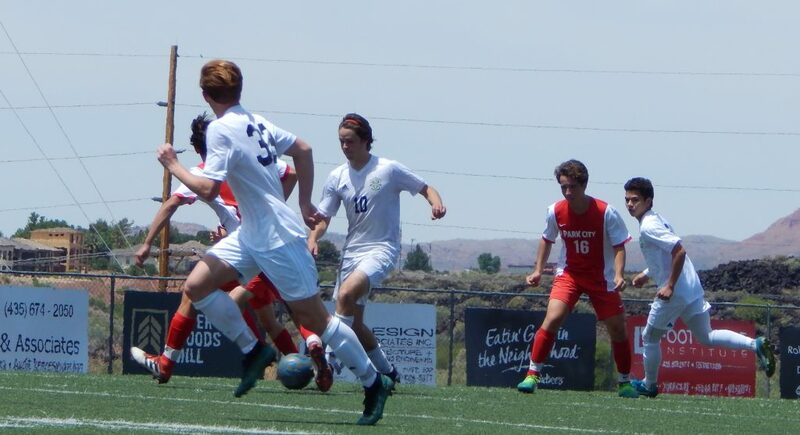 Desert Hills (11-2-4) battles Dixie in the late semifinal Friday at 1:45 p.m. Dixie beat D-Hills 4-0 at Thunder Field, but the two teams played to a 2-2 draw in early April. Park City (12-4-2) vs. Juan Diego (11-4-1), 11:30 a.m.
Desert Hills (11-2-4) vs. Dixie (12-1-3), 1:45 p.m.
Park City/Juan Diego winner vs. Dixie-Desert Hills winner, 3:30 p.m.